The warm weather is finally starting to arrive! We have had a busy March working with the Chambers of Commerce in Derry and Hampton. Most recently we were at the Business After Hours event put on by the Hampton Chamber at the Barley House. Own a small business? Getting involved in your local chamber can help with networking and finding new clients. These warmer temperatures can bring lots of rainfall with them. Below are some tips to keep you safe when driving in stormy weather. Water can also be a danger inside your house, read up on how water sensors can help you catch a problem early. As always, thank you for being a part of the Brownell Insurance Family. Remember – we offer free quotes for all of our insurance products. Please don’t hesitate to “Dare to Compare” the insurance coverages you might have elsewhere to see if “bundling” them might save you a few hundred dollars. 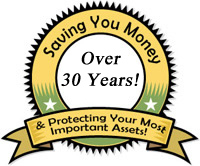 You just might find the service and savings you have been looking for! Driving in conditions that involve strong or heavy wind and rain may not seem like the most pressing safety concern for many drivers, but our safety professionals know that driving in any type of severe weather can significantly increase your risk and potential for a dangerous situation for you, your family and other drivers. Remember that severe weather demands your undivided attention, so be sure to reduce any possible distractions by turning the radio down or turning off that phone to keep your attention fully on the road. Keep in mind that sometimes the best driving decision you can make is to stay off the road completely until the weather clears. Wind may seem like a minor risk, but this weather condition deserves special consideration from drivers. Strong wind can occur just about anywhere, but it can be more common in wide open spaces. Areas for concern also include highway overpasses, tunnels and ‘road cuts’ through mountainous areas that can act as funnels for wind. 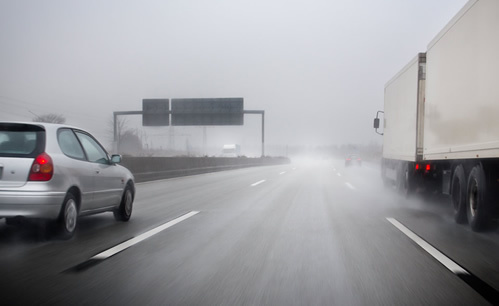 The following tips can help keep you on the road and safe if you encounter heavy winds. Anticipate gusts. Take special care when driving through areas prone to strong winds or when weather reports predict severe weather. Notice larger vehicles. Be aware of large vehicles on the road such as tractor-trailers and recreational vehicles. They are more susceptible to high winds and drivers may have difficulties staying in their lanes. Keep a firm grip on the wheel. Keep both hands on the wheel in case the wind begins to move your vehicle, especially if you are driving a large vehicle or towing a trailer. In addition to the potentially poor visibility that accompanies most heavy rain, drivers should be ready to protect themselves against hydroplaning. Hydroplaning can occur when a vehicle is traveling too fast in heavy rain conditions, causing the vehicle’s tires to travel on a thin layer of water rather than grip the surface of the road. This has the potential to make steering and braking difficult and could even lead to losing control of your vehicle. Follow these tips to help you stay safe while driving in heavy rain. Take your time. Slowing down is the only way to keep your vehicle from hydroplaning. Also remember that one of the most dangerous times to drive is soon after it begins to rain, as oils on roadway make for slick conditions. Waiting a few minutes, rather than rushing to your destination, can be a safer plan when it is raining. Turn your lights on. Turn your headlights on to help other vehicles see you. Many states require the use of headlights during rain, even in broad daylight. Give other vehicles more space. Add 1-2 extra seconds of following time in the rain, which gives you and the cars behind you more time to react to traffic. If the rubber hose on your washing machine fails, it can cause significant damage to your home. If that leak goes undetected in the basement or another room that you might not regularly visit, the accumulated water can cause potentially catastrophic damage, from moldy walls to warped floorboards. 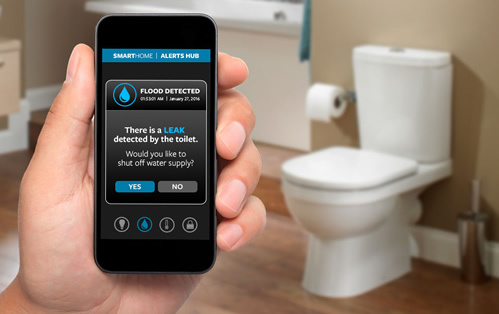 The smart technology in water sensor systems can help quickly alert homeowners of potential leaks and prevent the need for costly and time-consuming repairs. How Do Water Sensors Work? A water sensor can detect the presence of water, often by measuring the electrical conductivity of the water present and completing a circuit to send a signal. For installations that are not monitored by a professional alarm monitoring company, the sensor and its control module can send out a notification to the homeowner through an app that can be read on a smartphone. If you will be out of town, you can add family members, friends or other caretakers to receive notifications of a leak so they can quickly prevent further damage. Some water sensor systems can be programmed to shut off the water to the house to prevent a small leak from becoming a large one. However, during the heating season, if your home is heated by an older steam heating system, consult with your heating professional to determine if it is safe to turn off the water supply. Also, if your home is protected by a fire sprinkler system, do not turn off the water to this system. Where Should Water Sensors Be Placed? In addition to washing machines, failing hot water heaters, leaking dishwashers, damaged supply lines to automatic ice makers and overflowing toilets are some areas where water damage inside the home can occur, often without advanced warning. Performing regular maintenance and checking for rusty, corroded or damaged water supply lines and other potential problems before you have a leak is one of the best ways to help prevent water damage. Water sensors and their control modules are available at most home improvement stores. Note that some devices only work once, then need to be replaced, while others are more durable. Also, not all sensors come with clear installation instructions. If you are not comfortable installing them yourself, contact an experienced professional to install them and help ensure that you receive notifications of potential leaks. Directions: Preheat oven to 325 degrees F (165 degrees C). Grease a 9×5 inch loaf pan. Combine flour, baking powder, sugar, salt and baking soda. Blend egg and buttermilk together, and add all at once to the flour mixture. Mix just until moistened. Stir in butter. Pour into prepared pan. 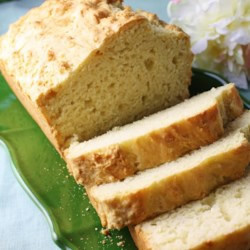 Bake for 65 to 70 minutes, or until a toothpick inserted in the bread comes out clean. Cool on a wire rack. Wrap in foil for several hours, or overnight, for best flavor. August 2018 – 5 Auto Premium Saving Tips, Smart Phones, Are They Covered?, Do you have the right coverage for your college student? April 2018 – April 2018 – Watch Out For Those Potholes, Factors for Seasonal Employers , Avoid Home Repair Scams This Spring, Pet Safety: Are You Thinking What She’s Thinking? 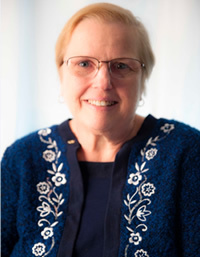 February 2018 – Navigating Medicare Workshop / Spring Driving Tips, Why Waiting Room Toys May Not Be Fun / Do I Need Umbrella Insurance?